After holding membership meetings throughout California and surveying our membership online, our union’s Executive Board adopted a resolution declaring NUHW a Sanctuary Union. Author Cal Winslow interviewed NUHW President Sal Rosselli about the resolution for this article, which was originally published in CounterPunch. 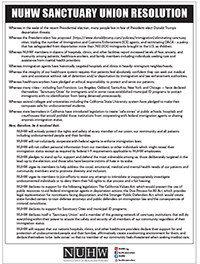 Click here to view NUHW’s Sanctuary Union resolution. Immigrant labor is vital to patient care. American hospitals and nursing homes employ workers from around the globe, and membership reflects that diversity. NUHW adopted the resolution after holding membership meetings and polling members. About nine of ten members support declaring NUHW a sanctuary union. I talked with Rosselli about the resolution and the challenges facing unions in the months to come. How did the “Sanctuary Union” resolution come about and how will it be implemented? Our Executive Board, which consists of elected rank-and-file members, wanted a strong political statement that immigrants are safe in this union and that we will protect and defend them. We thought the resolution would be controversial among our members. Our membership is diverse in terms of race, ethnicity, and political persuasion, and many of our members voted for Trump and are critical of illegal immigration. So we held membership meetings throughout the state to discuss the resolution and get feedback, and we polled our entire membership. Support for the resolution was very deep. A few members vehemently opposed the resolution, but nine out of ten supported it, so our board formally adopted it. Now we’re going to do a number of things. First, we’ll educate our members. Staff and stewards will make sure our members understand that one of our union’s primary responsibilities will be to protect and defend those of us who are undocumented immigrants or have family members who are undocumented. Secondly, our lawyers are partnering with a prominent immigrant rights law firm here in the Bay Area to establish legal and economic support for members who find themselves at risk of deportation. And finally, we will urge our members’ employers to make sure that these hospitals and clinics and nursing homes are safe places for both healthcare workers and patients — safe places to give and receive care. I should add that NUHW is doing this as part of Our Revolution. We endorsed Bernie Sanders in the primaries. So, we’re part of that movement, and we’ll organize workers when we can to support other ways to contribute. Tell me about a second resolution NUHW recently adopted, California version of Medicare for All. Our union has been leading on this issue since the early 1990s and we reaffirmed our support for universal coverage earlier this year. We define real healthcare reform as Medicare for All — a single-payer system. In the 1990s there were initiatives on the California ballot toward accomplishing Medicare for All and other patient protections. We worked with scores of organizations to craft and advocate for those initiatives, but none became law. Now, we have a new opportunity — even with all the things that are happening with the federal government and Obamacare. We have an opportunity in California to quickly achieve major healthcare reform for everyone in the state. State Senators Ricardo Lara (D-Bell Gardens) and Toni Atkins (D-San Diego) have introduced legislation that we strongly support. This is the way for California to get ahead of the curve and avoid the catastrophe of millions of people losing access to care. And if we can accomplish this in California, which has about 12 percent of the nation’s population, why not the whole country? What are you expecting now from the Trump administration? And what is NUHW’s strategy as of now? We have to prepare to resist. People that we care about — working people, immigrants, poor people — are going to have a much tougher time. So we’re beginning to figure out how, in a very bottom-up kind of way, we can educate our members about the problems with the new federal government and help them to organize others. Can you explain for us your commitment to winning parity for mental health care? One of our longstanding goals is to ensure that patients have the same access to mental health services as they do to traditional medical care. We represent more than 3,000 California behavioral health clinicians that work for Kaiser Permanente, the nation’s largest healthcare corporation, as well as mental health workers at UCSF Benioff Children’s Hospital in Oakland. Our concern is that under the Trump Administration, it will be much more difficult to achieve mental health parity. The changes he wants to make to the Affordable Care Act will severely limit access to behavioral health care. So, I’m afraid it’s going to get worse, much worse. We had a five-year battle with Kaiser over mental health parity. It took a long time to get Kaiser leaders to listen to their clinicians about the problems with Kaiser’s psychiatric services. We’re just now beginning to work together toward our common goal of making Kaiser the national leader in mental health care and the employer of choice for caregivers. Kaiser has finally recognized that they need to listen to their clinicians about how to address staffing issues and improve access to care. In Northern California, we recently convened a summit of Kaiser clinicians and managers to establish that relationship and start moving forward. What about the rest of California’s labor movement, can it do more? Absolutely. California has 6 million union members but far too many are members in name only. They’re not involved in their unions. Or worse — they’re held captive in unions that don’t have their best interests at heart. NUHW does things differently. Our view is simple: We believe we have a fundamental responsibility to empower workers. This means our members make the decisions and determine our priorities and how we spend their dues dollars. Our members elect their co-workers to steward councils and to our Executive Board, which, in turn, charts our course. That’s how we went about this process. Now we need to further educate our members about the importance of these issues and how together we can take action.